8 Then I heard the voice of the Lord saying, "Whom shall I send? And who will go for us?" And I said, "Here am I. Send me! " 1 In the thirtieth year, in the fourth month on the fifth day, while I was among the exiles by the Kebar River, the heavens were opened and I saw visions of God. 7 Their legs were straight; their feet were like those of a calf and gleamed like burnished bronze. 9 and their wings touched one another. Each one went straight ahead; they did not turn as they moved. 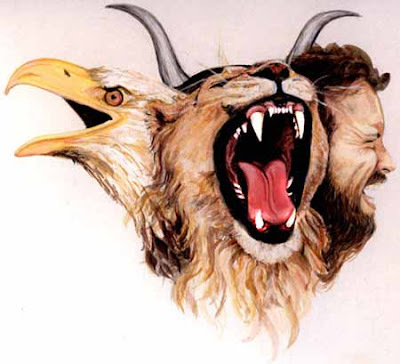 10 Their faces looked like this: Each of the four had the face of a man, and on the right side each had the face of a lion, and on the left the face of an ox; each also had the face of an eagle. 11 Such were their faces. Their wings were spread out upward; each had two wings, one touching the wing of another creature on either side, and two wings covering its body. 12 Each one went straight ahead. Wherever the spirit would go, they would go, without turning as they went. 13 The appearance of the living creatures was like burning coals of fire or like torches. Fire moved back and forth among the creatures; it was bright, and lightning flashed out of it. 14 The creatures sped back and forth like flashes of lightning. 16 This was the appearance and structure of the wheels: They sparkled like chrysolite, and all four looked alike. Each appeared to be made like a wheel intersecting a wheel. 17 As they moved, they would go in any one of the four directions the creatures faced; the wheels did not turn about as the creatures went. 22 Spread out above the heads of the living creatures was what looked like an expanse, sparkling like ice, and awesome. 23 Under the expanse their wings were stretched out one toward the other, and each had two wings covering its body. 24 When the creatures moved, I heard the sound of their wings, like the roar of rushing waters, like the voice of the Almighty, like the tumult of an army. When they stood still, they lowered their wings. 25 Then there came a voice from above the expanse over their heads as they stood with lowered wings. 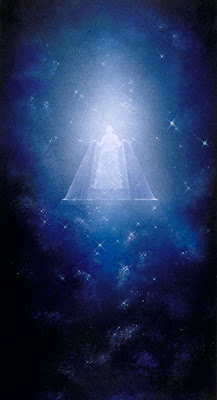 26 Above the expanse over their heads was what looked like a throne of sapphire, and high above on the throne was a figure like that of a man. Hebrews 8: 5 - They serve at a sanctuary that is a copy and shadow of what is in heaven. This is why Moses was warned when he was about to build the tabernacle: "See to it that you make everything according to the pattern shown you on the mountain." In Ezekiel 8-11 there seems to be a blending of views of the heavenly temple with views of the earthly temple. Perhaps, understanding that God is omnipresent, that he could be in both the earthly temple as well as the heavenly temple at the same time might clarify the understanding better. 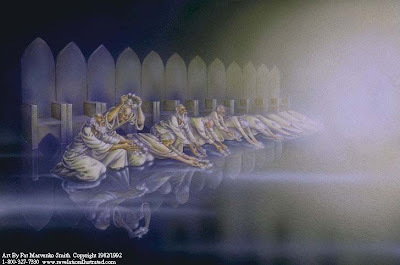 Here Ezekiel is given a vision of God leaving the earthly temple because of the wickeness of Israel's leaders, the corruption in the the temple and the falling away of the people's belief in God. 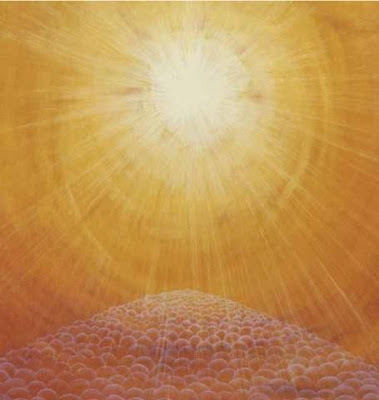 This peek at God in the earthly temple is so similar to the visions of God in the heavenly temple, I thought it should be included here as well. In Ezekiel 11: 16-20 , we are told that God will scatter the Israelites among the countries, BUT we are also told that this punishment would not last forever, that God would eventually bring them back to Israel, put a new spirit in them, and give them a heart of flesh. 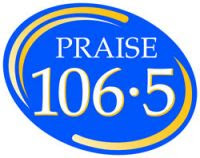 Praise God ! 1 In the sixth year, in the sixth month on the fifth day, while I was sitting in my house and the elders of Judah were sitting before me, the hand of the Sovereign LORD came upon me there. 3 He stretched out what looked like a hand and took me by the hair of my head. The Spirit lifted me up between earth and heaven and in visions of God he took me to Jerusalem, to the entrance to the north gate of the inner court, where the idol that provokes to jealousy stood. 8 He said to me, "Son of man, now dig into the wall." So I dug into the wall and saw a doorway there. 9 And he said to me, "Go in and see the wicked and detestable things they are doing here." 10 So I went in and looked, and I saw portrayed all over the walls all kinds of crawling things and detestable animals and all the idols of the house of Israel. 11 In front of them stood seventy elders of the house of Israel, and Jaazaniah son of Shaphan was standing among them. Each had a censer in his hand, and a fragrant cloud of incense was rising. 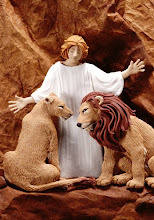 12 He said to me, "Son of man, have you seen what the elders of the house of Israel are doing in the darkness, each at the shrine of his own idol? They say, 'The LORD does not see us; the LORD has forsaken the land.' "
13 Again, he said, "You will see them doing things that are even more detestable." 14 Then he brought me to the entrance to the north gate of the house of the LORD, and I saw women sitting there, mourning for Tammuz. 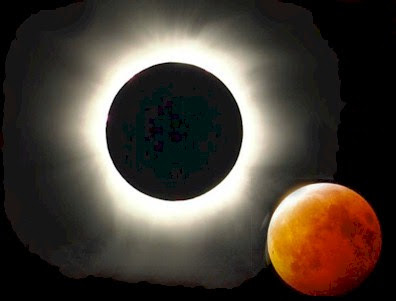 15 He said to me, "Do you see this, son of man? You will see things that are even more detestable than this." 17 He said to me, "Have you seen this, son of man? Is it a trivial matter for the house of Judah to do the detestable things they are doing here? Must they also fill the land with violence and continually provoke me to anger? Look at them putting the branch to their nose! 18 Therefore I will deal with them in anger; I will not look on them with pity or spare them. Although they shout in my ears, I will not listen to them." 1 Then I heard him call out in a loud voice, "Bring the guards of the city here, each with a weapon in his hand." 5 As I listened, he said to the others, "Follow him through the city and kill, without showing pity or compassion. 8 While they were killing and I was left alone, I fell facedown, crying out, "Ah, Sovereign LORD! Are you going to destroy the entire remnant of Israel in this outpouring of your wrath on Jerusalem?" 10 So I will not look on them with pity or spare them, but I will bring down on their own heads what they have done." 1 I looked, and I saw the likeness of a throne of sapphire above the expanse that was over the heads of the cherubim. 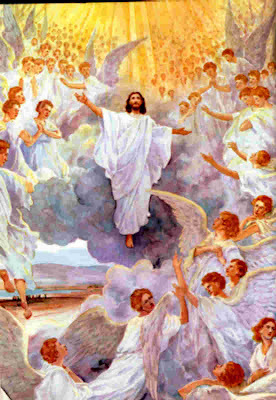 2 The LORD said to the man clothed in linen, "Go in among the wheels beneath the cherubim. 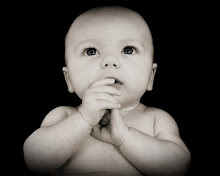 Fill your hands with burning coals from among the cherubim and scatter them over the city." And as I watched, he went in. 3 Now the cherubim were standing on the south side of the temple when the man went in, and a cloud filled the inner court. 4 Then the glory of the LORD rose from above the cherubim and moved to the threshold of the temple. The cloud filled the temple, and the court was full of the radiance of the glory of the LORD. 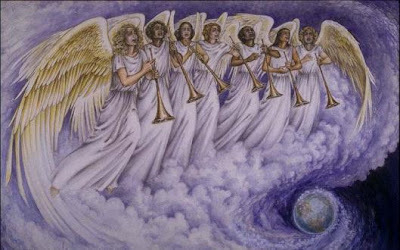 5 The sound of the wings of the cherubim could be heard as far away as the outer court, like the voice of God Almighty [Hebrew El-Shaddai ] when he speaks. 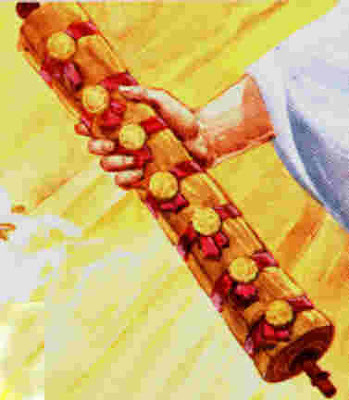 6 When the LORD commanded the man in linen, "Take fire from among the wheels, from among the cherubim," the man went in and stood beside a wheel. 7 Then one of the cherubim reached out his hand to the fire that was among them. He took up some of it and put it into the hands of the man in linen, who took it and went out. 9 I looked, and I saw beside the cherubim four wheels, one beside each of the cherubim; the wheels sparkled like chrysolite. 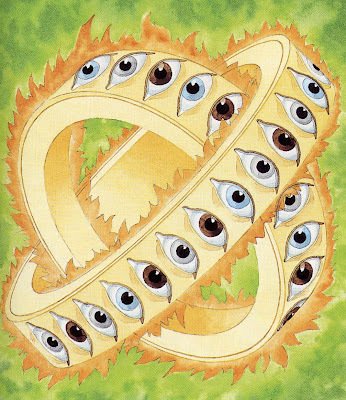 10 As for their appearance, the four of them looked alike; each was like a wheel intersecting a wheel. 11 As they moved, they would go in any one of the four directions the cherubim faced; the wheels did not turn about as the cherubim went. The cherubim went in whatever direction the head faced, without turning as they went. 12 Their entire bodies, including their backs, their hands and their wings, were completely full of eyes, as were their four wheels. 13 I heard the wheels being called "the whirling wheels." 14 Each of the cherubim had four faces: One face was that of a cherub, the second the face of a man, the third the face of a lion, and the fourth the face of an eagle. 15 Then the cherubim rose upward. These were the living creatures I had seen by the Kebar River [See Ezekiel 1 above]. 16 When the cherubim moved, the wheels beside them moved; and when the cherubim spread their wings to rise from the ground, the wheels did not leave their side. 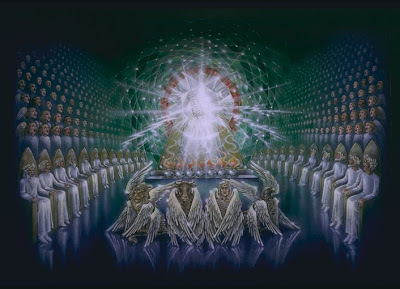 17 When the cherubim stood still, they also stood still; and when the cherubim rose, they rose with them, because the spirit of the living creatures was in them. 19 While I watched, the cherubim spread their wings and rose from the ground, and as they went, the wheels went with them. They stopped at the entrance to the east gate of the LORD's house, and the glory of the God of Israel was above them. 20 These were the living creatures I had seen beneath the God of Israel by the Kebar River, and I realized that they were cherubim. 21 Each had four faces and four wings, and under their wings was what looked like the hands of a man. 22 Their faces had the same appearance as those I had seen by the Kebar River. Each one went straight ahead. 9 "As I looked, "thrones were set in place, and the Ancient of Days [God] took his seat. His clothing was as white as snow; the hair of his head was white like wool. His throne was flaming with fire, and its wheels were all ablaze. 10 A river of fire was flowing, coming out from before him. Thousands upon thousands attended him; ten thousand times ten thousand stood before him. 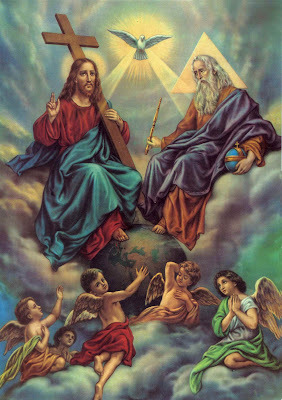 The court was seated, and the books were opened. . . .
13 "In my vision at night I looked, and there before me was one like a son of man [Jesus] , coming with the clouds of heaven. He approached the Ancient of Days and was led into his presence. 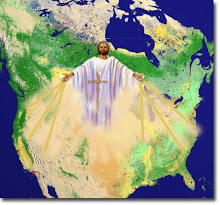 14 He was given authority, glory and sovereign power; all peoples, nations and men of every language worshiped him. His dominion is an everlasting dominion that will not pass away, and his kingdom is one that will never be destroyed. . . .
22 until the Ancient of Days came and pronounced judgment in favor of the saints of the Most High, and the time came when they possessed the kingdom. 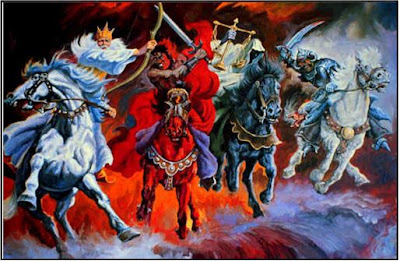 . . . .
25 He [the horn] will speak against the Most High and oppress his saints and try to change the set times and the laws. The saints will be handed over to him for a time, times and half a time. 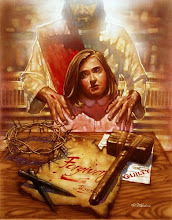 26 " 'But the court will sit, and his power will be taken away and completely destroyed forever. 1 I looked up again—and there before me were four chariots coming out from between two mountains—mountains of bronze! 3 the third white, and the fourth dappled—all of them powerful. 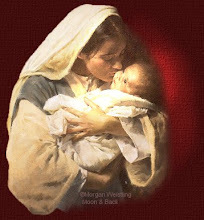 4 I asked the angel who was speaking to me, "What are these, my lord?" 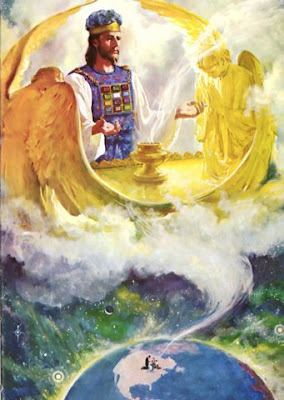 5 The angel answered me, "These are the four spirits [or winds] of heaven, going out from standing in the presence of the Lord of the whole world. 6 The one with the black horses is going toward the north country, the one with the white horses toward the west, and the one with the dappled horses toward the south." 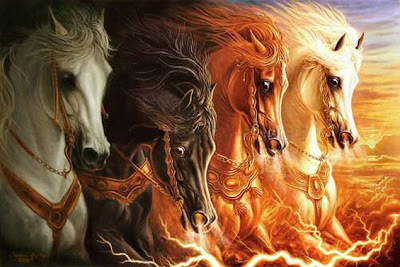 7 When the powerful horses went out, they were straining to go throughout the earth. And he said, "Go throughout the earth!" So they went throughout the earth. 8 Then he called to me, "Look, those going toward the north country have given my Spirit rest in the land of the north." The Rich Young Man . . .
23 Then Jesus said to his disciples, "I tell you the truth, it is hard for a rich man to enter the kingdom of heaven. 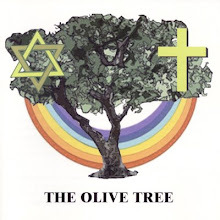 28 Jesus said to them, "I tell you the truth, at the renewal of all things, when the Son of Man sits on his glorious throne, you who have followed me will also sit on twelve thrones, judging the twelve tribes of Israel. 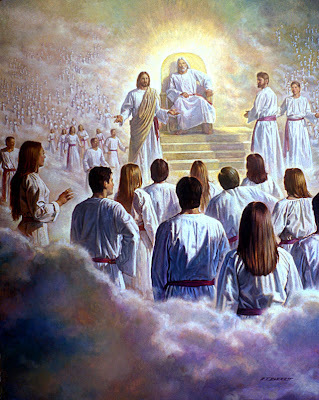 29 And everyone who has left houses or brothers or sisters or father or mother or children or fields for my sake will receive a hundred times as much and will inherit eternal life. 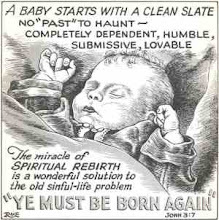 2 and who serves in the sanctuary, the true tabernacle [in heaven] set up by the Lord, not by man. 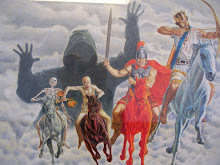 5 From the throne came flashes of lightning, rumblings and peals of thunder. Before the throne, seven lamps were blazing. These are the seven spirits [Or the sevenfold Spirit ] of God. 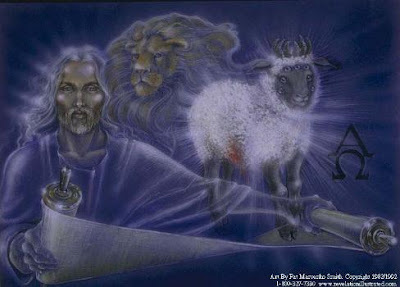 6 Then I saw a Lamb, looking as if it had been slain, standing in the center of the throne, encircled by the four living creatures and the elders. He had seven horns and seven eyes, which are the seven spirits [Or the sevenfold Spirit ] of God sent out into all the earth. 11 the name of the star is Wormwood. [Bitterness ] A third of the waters turned bitter, and many people died from the waters that had become bitter.